Over on Instagram I became fascinated by the bread videos of Trevor Jay Wilson, marvelling at how gentle he is with his dough and how wonderfully that dough performs for him. His website is a treasure trove of sound, practical advice that gives far more detail than the little clips on Instagram. 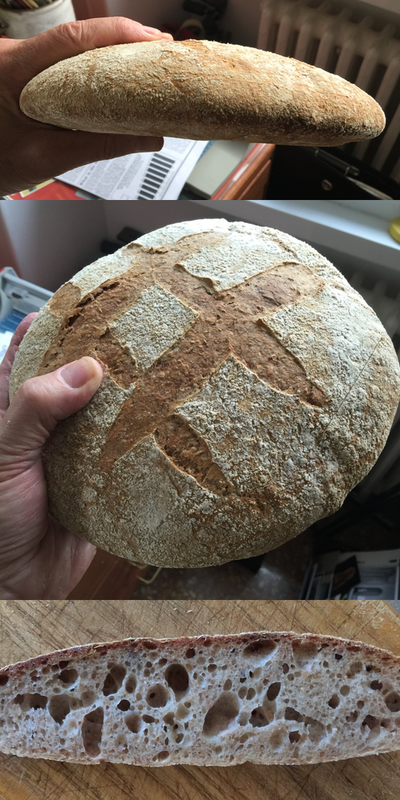 I decided to follow his technique for a 50% wholewheat sourdough, with a twist. He uses bread flour; that is, strong flour, with a high protein content that builds a strong gluten network to support the heavier wholewheat. Strong flour goes by the generic name Manitoba in Italy, even if it doesn’t come from Canada, but for some reason stocks have dried up. Neither of my two regular suppliers have any at the moment. So I had to use ordinary flour, and it is undeniably weaker. You can see that in the photos. I won’t do a proper write-up here until I have cracked it to my own satisfaction. I will note that the rise was definitely less than I had hoped for, but that was not entirely surprising given the weakness of the dough. But the crumb structure was great, as was the flavour. I’m definitely going to keep trying this method, once I manage to score some stronger flour. And I’m going to keep watching Trevor Jay Wilson as I try to improve my dough handling skills. One tip I’ve picked up: use a wet hand, when necessary, to avoid stickiness.